When UB40 released their debut album Signing Off in 1980, few could have suspected the global success that the Birmingham reggae-pop act would achieve, selling 70 million records over three-and-a-half decades. With their first three albums about social injustice, UB40 appealed to a generation raised on punk and reggae, reaching number two in the UK charts with their debut and follow-up Present Arms. “We’ve got working class politics, and I think that shone out from the first couple of albums,” says guitarist and founder Robin Campbell. Their fourth studio album Labour of Love saw the group achieve their first UK number one single with a cover version of Neil Diamond’s Red Red Wine. The album led many of UB40’s fans to accuse the group of covering love songs to make money and betraying their working class roots. “The success of Labour of Love changed a lot of people’s attitudes towards us - I’m really tired of people saying that we sold out,” says Robin. “The first album had cover versions on it, but maybe they were less well-known songs. “Nothing’s really changed - we’ve done a series of cover albums. I think we’ve done four out of 18 albums. 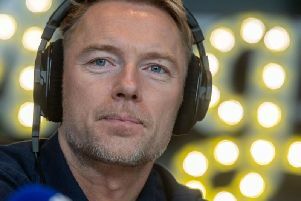 “Nothing’s really changed except we release a new covers album every seven or eight years - we do those albums for fun, and we wanted to do them from when we started - they’re just covers of the songs we grew up on, the songs that made us want to be UB40 in the first place,” he says. Growing up in Birmingham during the 60s, Robin says he was inspired by the varied music he was exposed to, especially from the immigrant communities from the Caribbean that had made their home in the city. “I grew up on the Beatles the same as everybody else and all the English pop music of the day - Merseybeat and all that,” says Robin. “Before that I was listening to ska, which was the then Jamaican pop music - that was because I had a lot of Jamaican friends who all played ska. “In the summer of ‘67 reggae happened - it was rocksteady, it wasn’t even called reggae then - and that changed my life,” he says. “I became obsessed with this new form of music - the pop music slowed down and the bass and drums became the prominent thing and the song and the singer became less important than the ‘riddim’ - it changed the way I listened to music. “It was people like Jimmy Cliff, Desmond Dekker and Ken Boothe - all these people had hit records in the British charts before the 70s happened, and before Marley and the Wailers happened. “They dressed the same as the other pop artists at the time - they’d wear flares and these horrible, flowery shirts - I thought reggae was going to rule the world. “It wasn’t perceived as political music until the 70s when Bob Marley happened, but Marley was just one artist and lots of other artists jumped on the bandwagon - they grew dreadlocks and started singing ‘conscious’ lyrics,” he says. Former UB40 lead singer Ali Campbell released his debut solo album in 2007 and announced that he had left the group the following year. Following Ali’s departure, UB40 recruited Robin’s younger (and Ali’s elder) brother Duncan to step in as lead vocalist and he has been performing with the group since. “When Ali left it was very difficult - it was quite traumatic,” says Robin. “It was heading that way for a couple of years - he was obviously unhappy being in the band and there was always the threat that he was going to go solo - and he did. “We were tremendously lucky that I had another younger brother who should have and could have been in the band from the beginning, but he opted not to be and regretted it ever since. “When Ali left, I went to Duncan and said ‘how do you fancy the job?’ obviously, he jumped at it and also got Ali’s blessing over the phone. “Since then, Ali hasn’t spoken to him or me - it’s all very disappointing, it’s all very silly,” he says. “We still make a sound that is instantly recognisable as UB40 and with the similarity of Duncan’s voice to Ali’s, we can do a pretty good version of the old stuff. “It’s not that weird - when you look at other family bands where brothers sing together, there is a tonal quality that brothers share - that’s why I knew we were incredibly lucky to have another brother that would be able to give us that. Recently, the dispute came to a head when Ali, along with other former UB40 members Mickey Virtue and vocalist Terence “Astro” Wilson went on tour using the UB40 name. “There’s only one UB40 - we’ve never stopped. It’s difficult to talk about, but we’re taking our brother to court to stop him using the name of the band that he left eight years ago. lUB40 will appear at the Victoria Theatre, Halifax on Saturday, May 9. Only rerstricted viewing seats are left, for more information call the box office on 01422 351158.